In this tutorial we will go through the programming of input capture mode for timer module of ARM Cortex-M3 LPC1768 microcontroller along with a frequency counter example using capture input. In my previous LPC1768 Timer tutorial we saw how to setup and program the timer module. When using Capture Inputs we use Timer Block in Normal ‘Timer Mode‘ or ‘Counter Mode‘. In Timer Mode, the Peripheral clock is used as a clock source to increment the Timer Counter(TC) every ‘PR+1’ clock cycles. Whenever a signal edge(rising/falling/both) event is detected, the timestamp i.e. the current value of TC is loaded into corresponding Capture Register(CRx) and optionally we can also generate an interrupt every time Capture Register is loaded with a new value. This behavior is configured using CCR. Here is a simple diagram depicting the capture process. Dashed arrows(for both diagrams) signify the events. 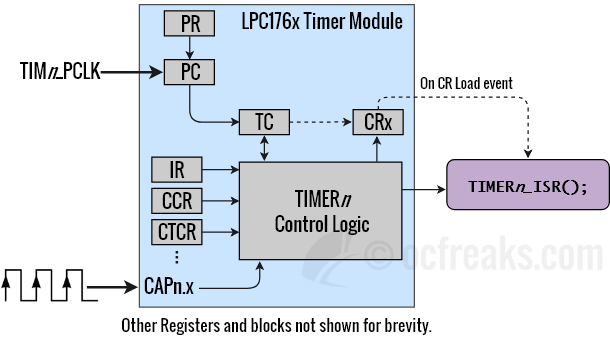 Since I have already discussed main Timer Registers in my LPC1768 Timer tutorial, we will only have a look at registers relating to capture. 1) CCRx – Capture Control Register: Used to select which type of Egde(rising/falling/both) is used to Capture Registers (CR0-CR1) and optionally to generate an interrupt when a capture event occurs. Bit 0: Capture on CAPn.0 rising edge. When set to 1, a transition of 0 to 1 on CAPn.0 will cause CR0 to be loaded with the contents of TC. Disabled when 0. Bit 1: Capture on CAPn.0 falling edge. When set to 1, a transition of 1 to 0 on CAPn.0 will cause CR0 to be loaded with the contents of TC. Disabled when 0. Bit 2: Interrupt on CAPn.0 event. When set to 1, a CR0 load due to a CAPn.0 event will generate an interrupt. Disabled when 0. Similarly bits 3-5, are for CR1. 2) CR0 & CR1 – Capture Registers: Each capture register is associated with a Capture Pin. Depending on the settings in CCR, CRn can be loaded with current value of TC when a specific event occurs. 3) CTCR Count Control Register: Used to select between Timer or Counter Mode. Bits[1:0] – Used to select Timer mode or which Edges can increment TC in counter mode. : Timer Mode. PC is incremented every Rising edge of PCLK. : Counter Mode. TC is incremented on Rising edges on the CAP input selected by Bits[3:2]. : Counter Mode. TC is incremented on Falling edges on the CAP input selected by Bits[3:2]. : Counter Mode. TC is incremented on Both edges on the CAP input selected by Bits[3:2]. Bits[3:2] – Count Input Select. Only applicable if above bits are not . : Used to select CAPn.0 for TIMERn as Count input. : Used to select CAPn.1 for TIMERn as Count input. By Gating/Probing – In this method we define a Gating Interval in which we count the number of pulses. What is Gating Time? – Gating Time is amount of time for which we probe the input signal. Once we know the no.of. pulses, we can easily deduce the frequency using Gating time. Here we use the external signal as clock source to increment Timer Counter (TC). The value in TC gives the number of pulses counted per Gating Time. This method relies on selecting a proper Gating Time to get valid and accurate results. By measuring Period using Interrupts – In this method we use an Interrupt Service Routine to find out the time between 2 consecutive pulses i.e. period of the Input signal at that particular instant. This is done using an ISR, but ISR itself is main limiting factor for the maximum frequency which can be measured. Compared to first one, this method can give accurate results, given frequency is below measurement limit. The maximum input signal frequency which can be reliably measured using first method is half of TIMERn_PCLK, since it takes two successive edges of TIMERn_PCLK to detect one edge of external signal. Hence, using a TIMERn_PCLK of 100Mhz we can measure upto 50Mhz signal properly. For second method we can only measure up to around 0.83 Mhz due to ISR execution delay & context switching overhead. For measuring Square wave Signal Frequency, external hardware is not required unless the Pulse HIGH Voltage level is > 3.3 Volts, in which case a Voltage divider or Buffer is mandatory. To measure other Signal types like Saw-tooth, Sine wave we will require something that can provide Hysteresis which will define the HIGH & LOW Voltage Threshold, thereby converting it into a Square signal, to detect any of the edges of the unknown signal. This can be done using a Schmitt Trigger Buffer (either Inverting or Non-Inverting – doesn’t matter). For both of examples given below, we will use Timer2 module to measure frequency. Capture Channel CAP2.0 is used as capture input. CAP2.0 is mapped to Pin P0.4 on LPC1768, hence we select CAP2.0 alternate function for P0.4. On mbed platform P0.4 is labelled as p30 and P2.0 as p26. Schematic is also same for both. To generate a square wave output, we can use LPC176x’s inbuilt PWM module, configured with 0.02 us resolution. 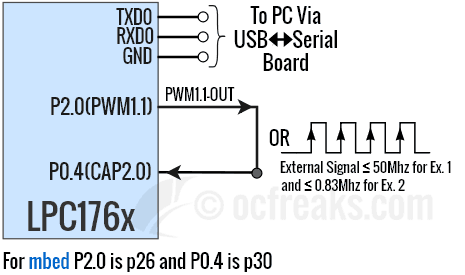 PWM1.1 output channel is used which gives output on Pin P2.0. Refer my LPC1768 PWM Tutorial for more on PWM. You can also use any external source like a function generator or IC-555 based generator. The example projects linked below also contain retargeted printf() for KEIL which redirects its output to UART0. LPC_SC->PCONP |= (1<<22); //Power-Up Timer2 module. It is disabled by default. LPC_SC->PCLKSEL1 |= (1<<12); //Set bits[13:12] =  to select PCLK_TIMER2 = CCLK i.e. 100Mhz in our case. LPC_SC->PCLKSEL0 |= (1<<12); //Set bits[13:12] =  to select PCLK_PWM1 = CCLK i.e. 100Mhz in our case. //PWM Generation goes active now!! KEIL ARM uV5/uV4 Project for above example LPC176x Frequency Counter Example 1 [Successfully tested on Keil uV5.23], Download Project Zip. You can find the HEX file inside objects folder. Here, a timer resolution of 0.02us (or 20ns) is selected by using Prescaler value of 1 with PCLK=CCLK=100Mhz. We configure CCR so that the capture occurs for rising edges and an interrupt is also generated. where, TC_MAX = Maximum value of TC and OVF_CNT = Number of times overflow occurred. Since TC is 32bit, its max value in our case is 0xFFFFFFFF. Also, since we are not measuring extremely low frequency signals OVF_CNT will be at max 1. Another thing is that, if OVF_CNT is >=2 then we will need a datatype of long long (8 bytes) to store the result since we won't be able to store the result in int which is 4 bytes for KEIL ARM compiler. Maximum value for frequency of external signal that can be reliably measured depends on the PCLK, Prescalar (PR) and the execution Latency of Timer Interrupt Routine. Out of the three, the main limiting factor is the interrupt execution latency. If the frequency is too fast, an Interrupt Request (IRQ) will be raised even before current IRQ has been served. If this happens the pending interrupt flag will be set and cpu will immediately serve the same ISR without entering main() function. This will happen back to back and the code inside main() won't execute unless signal frequency is reduced. Also, for measurement to be reliable, NO new IRQ must be raised while ISR is under execution. Hence, inside ISR we will have to add additional code to indicate this condition using a flag. Inevitably this will increase the interrupt latency, but never the less we will be able reject 'over-the-limit' frequencies without stalling the code inside main(). While testing the code given below I was able to measure frequencies around 833Khz or 0.83Mhz without stalling code inside main. #define TIMER_RES 0.02 //Depends on Timer PCLK and PR. Used to convert measured period to frequency. In the Frequency Counter Program given above, you can increase the values for LPC_PWM1->MR0 and LPC_PWM1->MR1 to measure other lower frequencies. The program will reject frequencies above 833.3 Khz. KEIL ARM uV5/uV4 Project for above example LPC176x Frequency Counter Example 2 [Successfully tested on Keil uV5.23], Download Project Zip. You can find the HEX file inside objects folder.